Sign screw caps are 3/4" in diameter and 1/4" deep. The decorative knob is finished in a satin silver style. 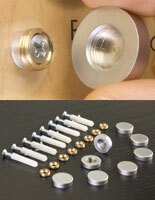 The knobs are designed to work with 4mm threaded screws or studs. 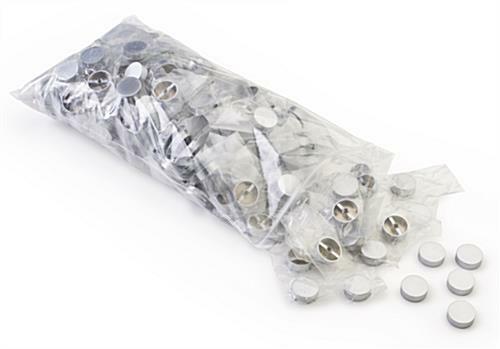 A single order of this item includes a bag of 200 caps. This knob hardware, furniture fixture highlights company signage beautifully and cheaply! 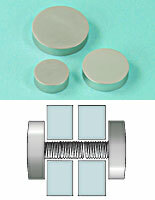 Sized ¾" in diameter, accessories such as this one are ¼" high and low profile so the graphics receive the attention. Designers love deco caps like this knob hardware because they are so versatile. This cabinet or wall fixture is similar to drawer pulls for a piece of furniture in that it is a small touch that makes a big impact. 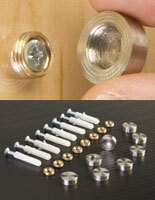 Mount photographs, advertising and other signage using this fastener. This deco knob hardware is one of our most popular accessories because it is priced along the line of plastic, but made of durable brass! 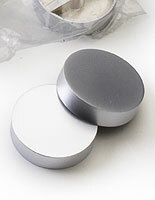 This chrome finish mount, like caps, is great for pictures, two-sided sandwich displays (where the image goes between two panes of glass), and signage on a lectern, cabinet or piece of furniture. 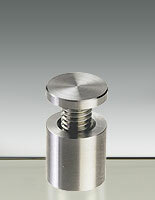 This knob hardware is best for professional offices that desire low-profile sign applications. Buy this fixture kit today! Sign shops love this knob hardware because it's great quality at a very low price. The threaded studs on this deco fixture keep the image secure. Contractors love this knob hardware, caps that are accessories for a cabinet, wall or piece of furniture, for larger jobs because the costs stay down. These deco items are shipped 200 at a time, so enjoy the amazing bulk pricing! 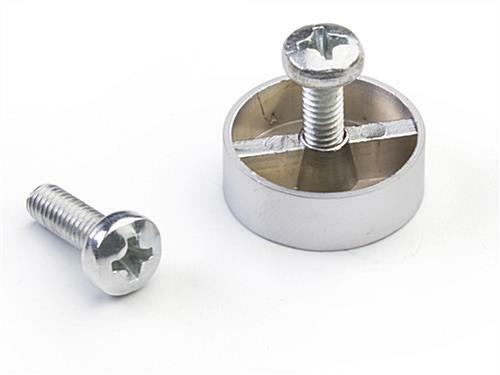 Each of these accessories, like screw caps are compatible with 4mm screws or studs. Buy this knob hardware to place near a cabinet or on a wall! 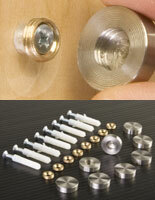 This knob hardware is a must-have if you're a signmaker or designer. It really pulls the attention onto your signage!